This is the stuff I found at Publix. 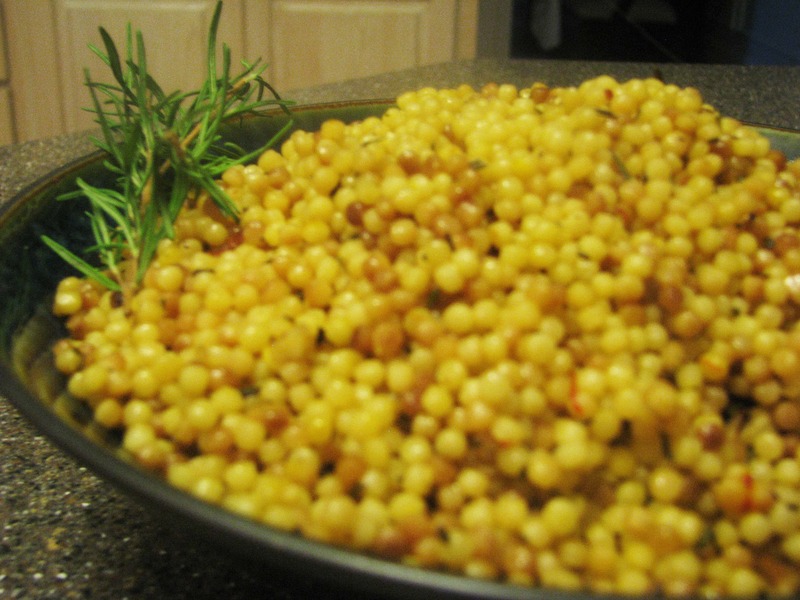 Note: you can substitute Israeli couscous for regular couscous, farro, barley, or quinoa using the same flavors in this recipe. First, bring a big pot to medium-high heat with some olive oil in the bottom. 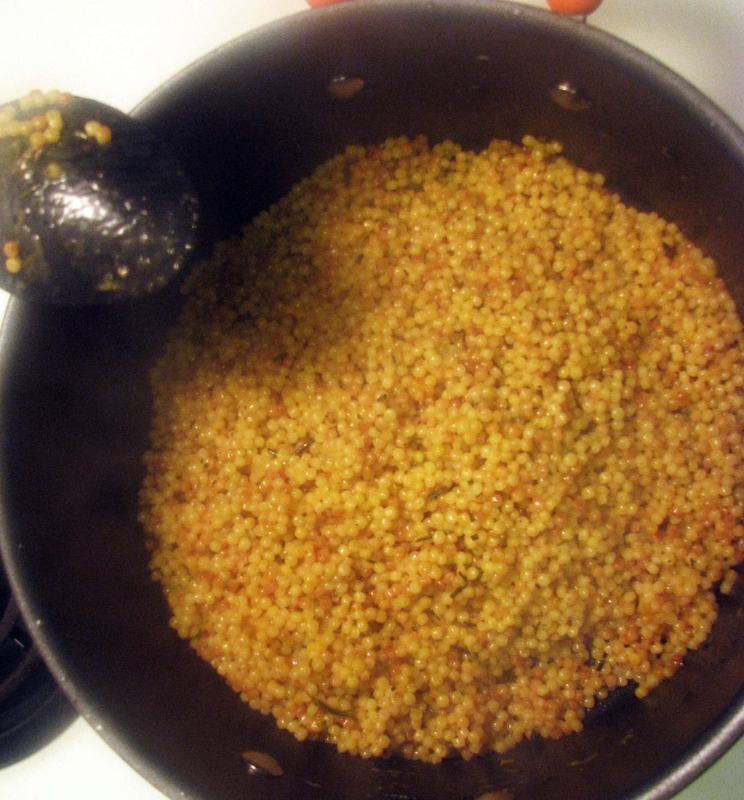 I had some garlic-infused oil that I used up for this – about two tablespoons for six servings of couscous. If you like garlic and don’t have any infused oil (I made my own for roasted tomatoes, it wasn’t fancy), you can add one clove of minced garlic once you add the rosemary – this is totally your call though! 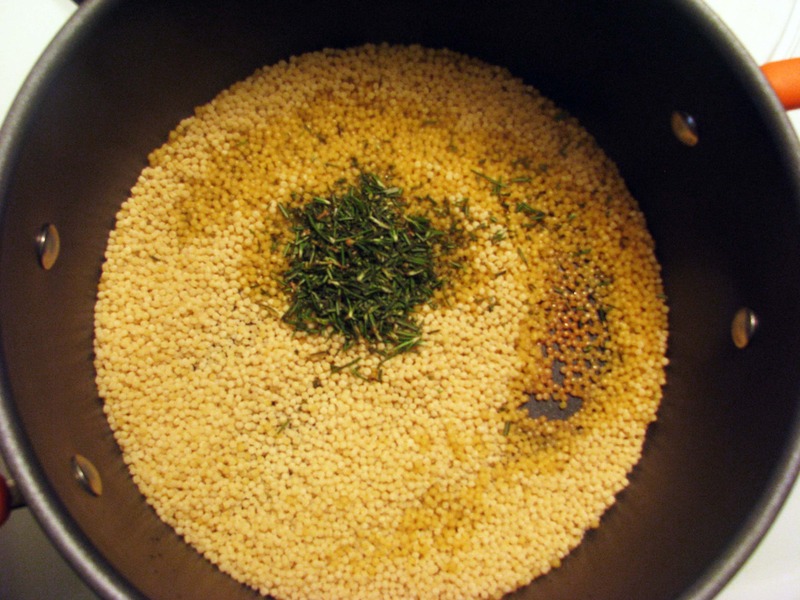 While your oil is coming to a high temperature, measure out six servings of couscous and the corresponding amount of stock – whatever the package you bought says. Then it’ll be all ready for you! Grab some saffron, rosemary, and salt while you’re at it. 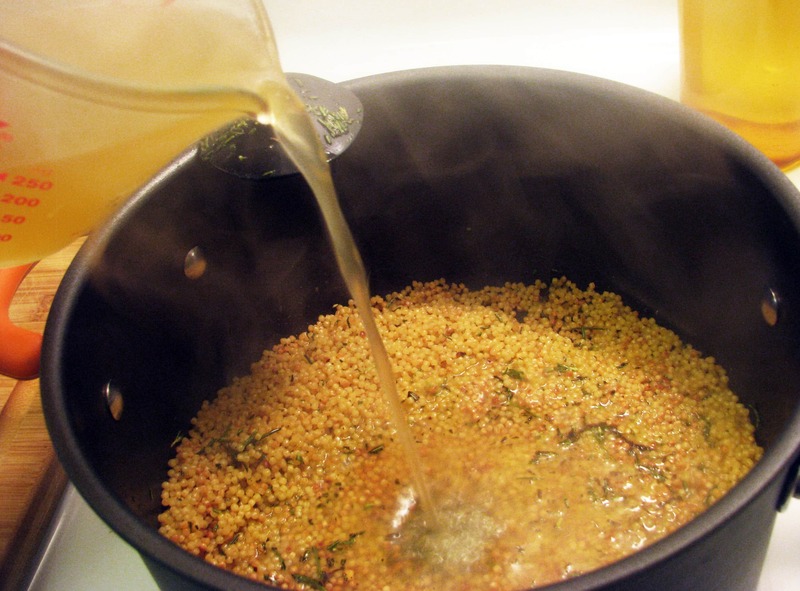 Once the oil is hot, add your dry couscous to the pan and stir it around to coat it in the oil and let it start toasting. 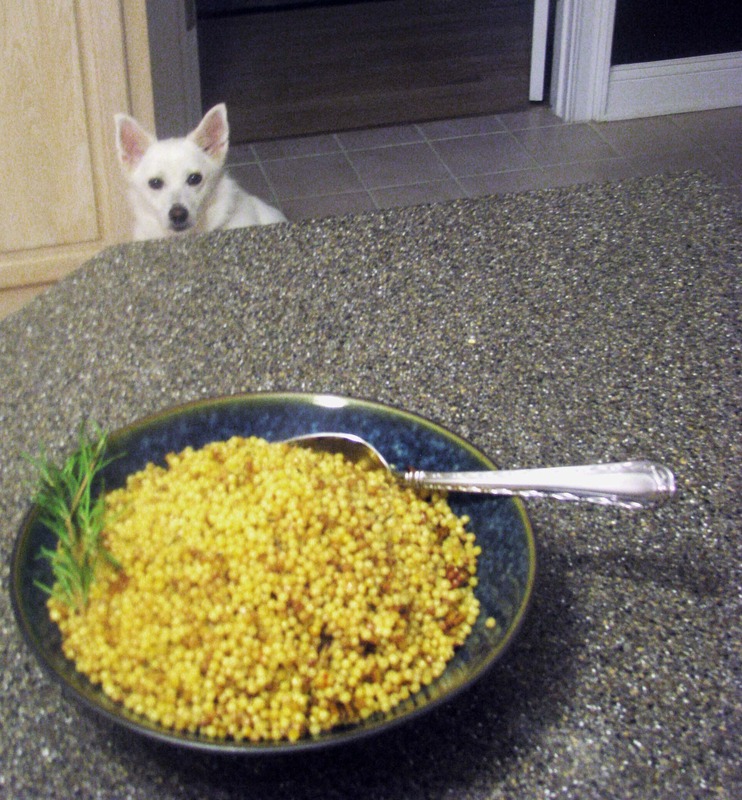 While the couscous is toasting, get two big sprigs of fresh rosemary. 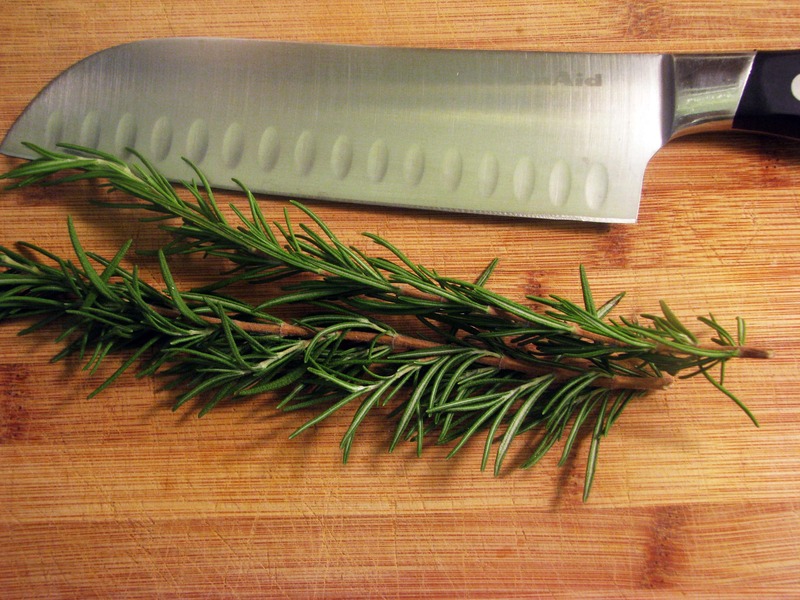 If you don’t have fresh rosemary skip this step and use 1 teaspoon of dried rosemary – no biggie. 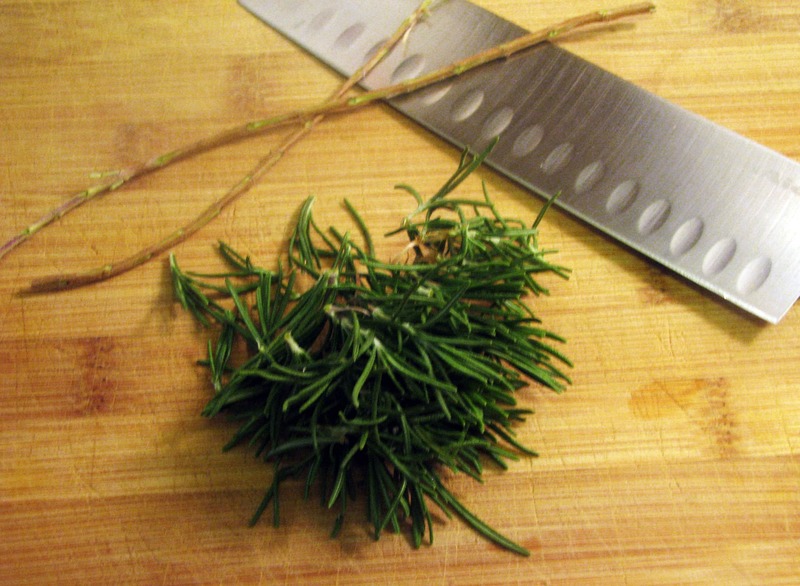 To prepare the rosemary, strip the leaves by pulling them off the stem backwards. 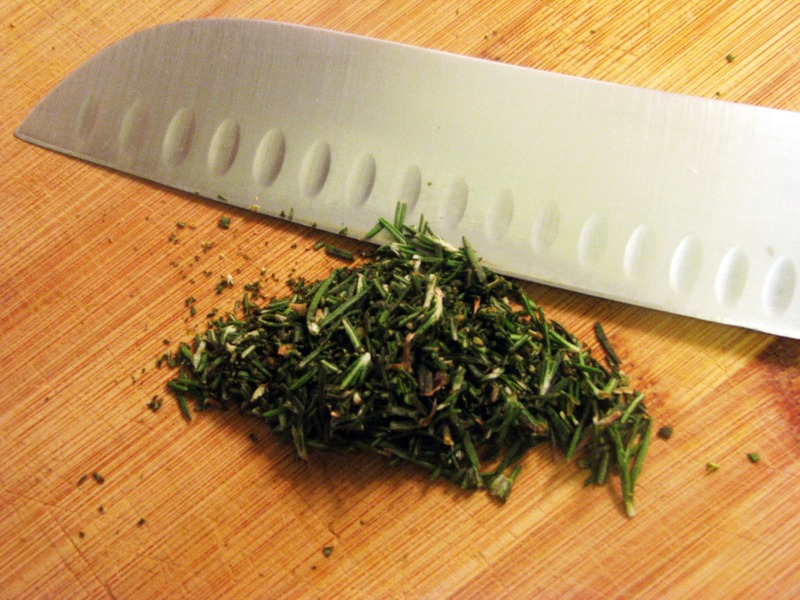 Then run your knife over the leaves over and over until the leaves are chopped up. 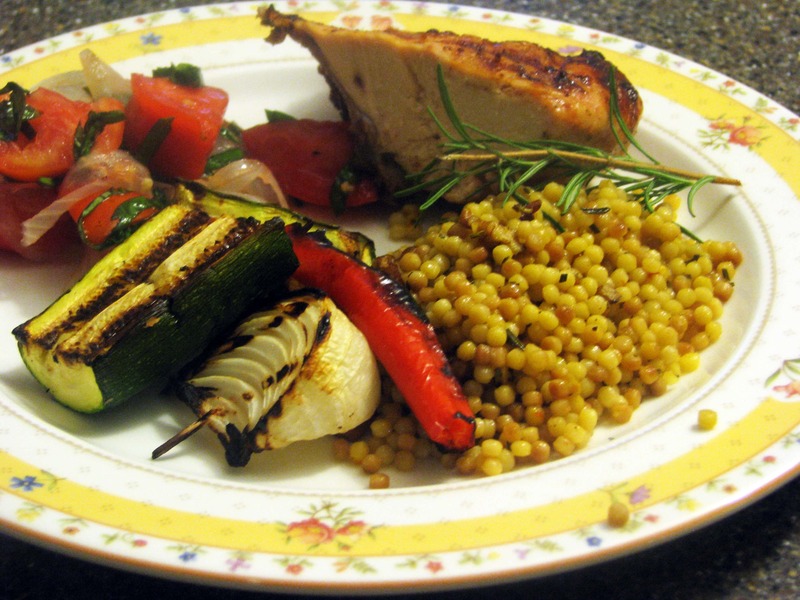 By now, your couscous should have toasted for about five minutes. If the granules are starting to turn a little brown, add the chopped rosemary and garlic, if you’re using it. Then stir everything together and let it keep cooking and toasting for one or two more minutes. See how the couscous is turning a little darker? That’s perfect. Now it’s time to add in your chicken stock. 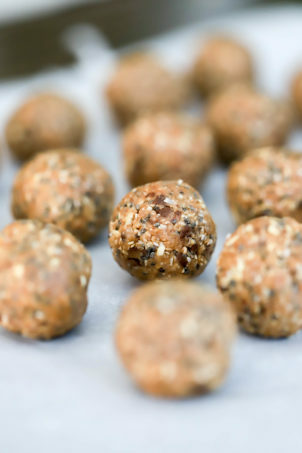 If you’re watching your sodium content or run out of chicken stock, you can use half stock and half water or 1 chicken bouillon cube. As long as you have the right amount of liquid it won’t matter! Then, add 1/2 to 1 teaspoon of saffron threads – found in the spice aisle and sometimes with specialty Mexican spices. 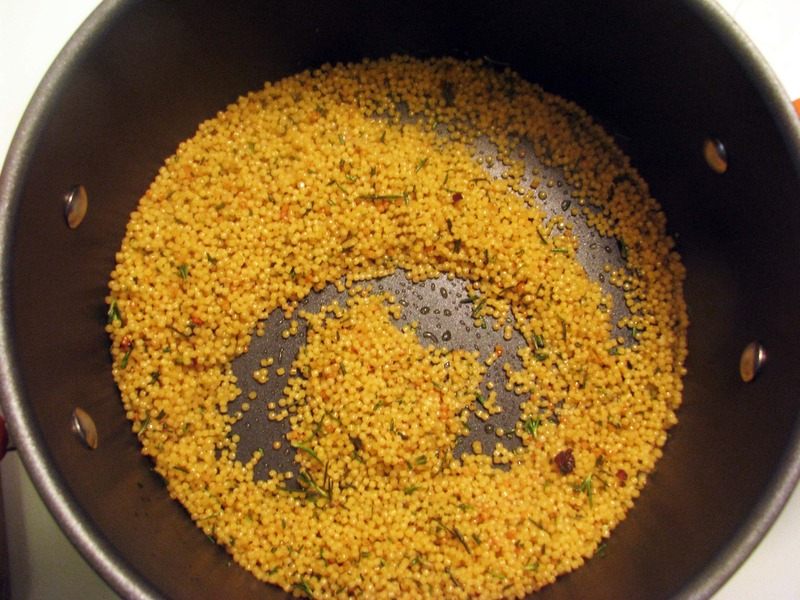 Saffron adds a lovely floral (not flowery, don’t worry) flavor to the couscous and makes everything nice and yellow. 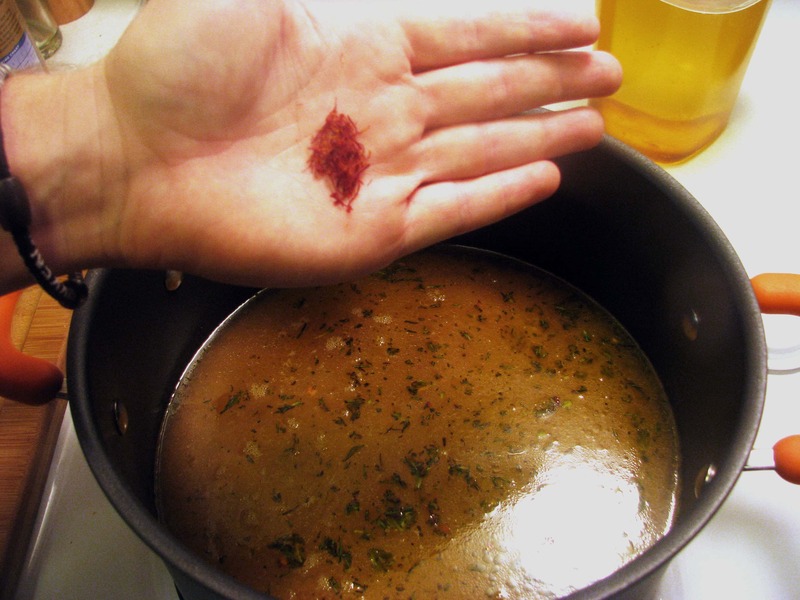 Once the rosemary, stock, and saffron are in, cover the pot and BOIL GENTLY for the recommended time, about 12-14 minutes. After ten minutes of cooking, remove the lid, stir the couscous, and assess the situation. 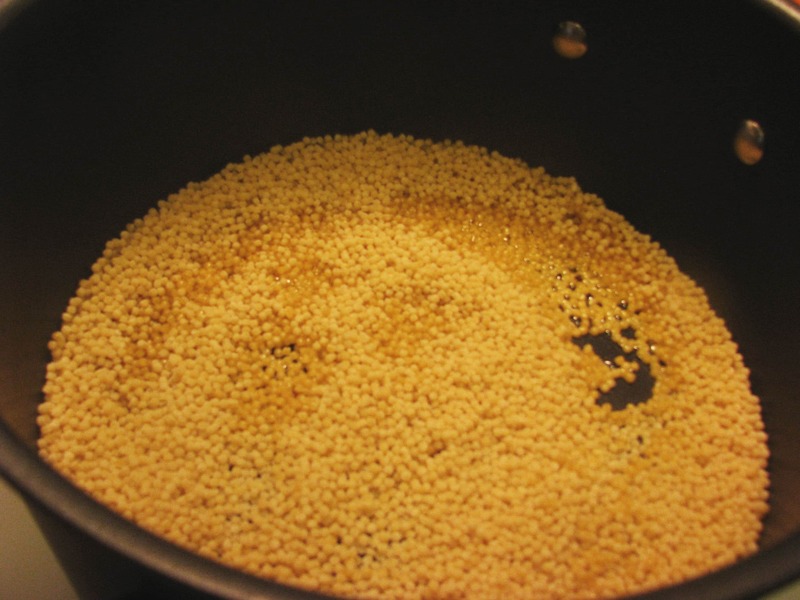 Taste the couscous: if it’s still sticky or crunchy it needs more cooking time – there should still be some liquid left. If there isn’t, add a little more, cover, and give it some more cooking time. 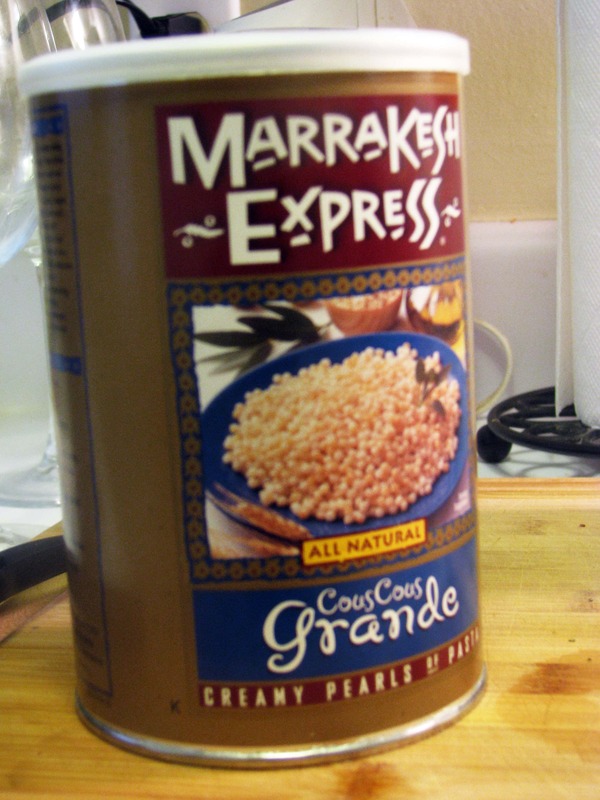 If the couscous tastes done (like al dente pasta), but there’s liquid in the pot, leave the lid off so the excess liquid evaporates but the couscous doesn’t keep cooking. 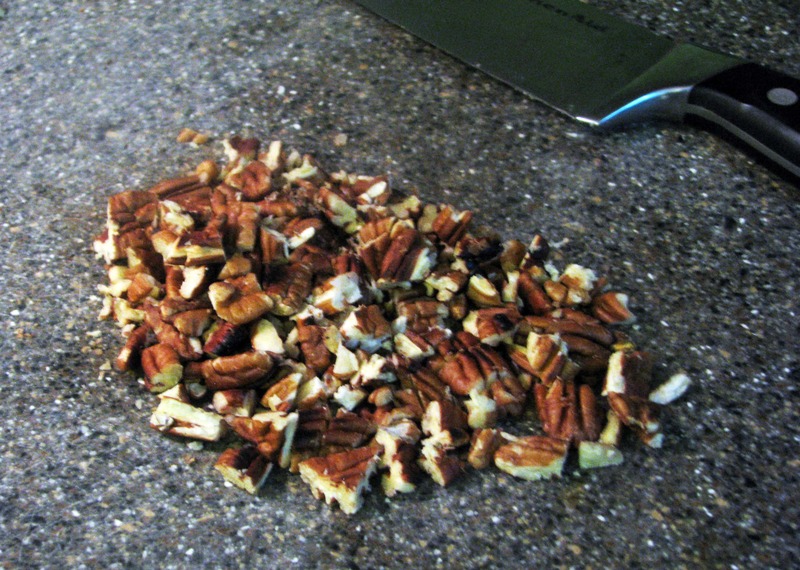 Now that the couscous is done (or you can do this in advance), lets toast some pecans to add some crunch to the couscous. 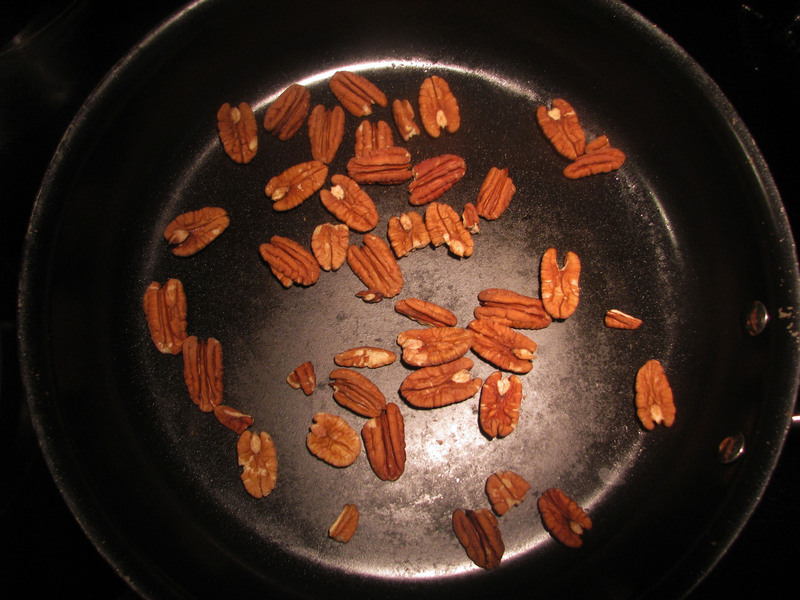 Put 1/2 pecans in a dry skillet over medium high heat for about 4 minutes. Shake the pan often to prevent burning, and as soon as you smell the nuts (ew, thatswhatshesaid) and they start to turn slightly darker on the outside they’re done! Chop them up and stir them in to your couscous. This is my parents' dog, Nala. She has very sophisticated taste in middle-eastern side dishes. 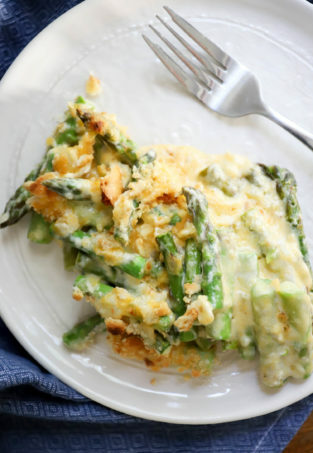 This is great with grilled chicken and veggies. 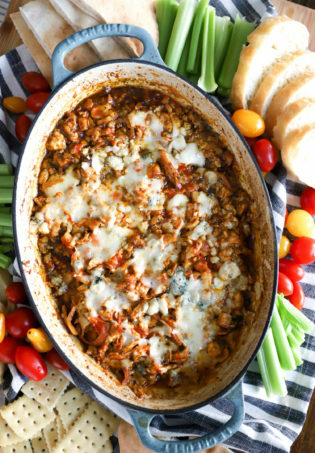 The rosemary flavor adds lot to plainer foods on the side. You could also squeeze some lemon juice over the whole thing for an added kick. Enjoy! 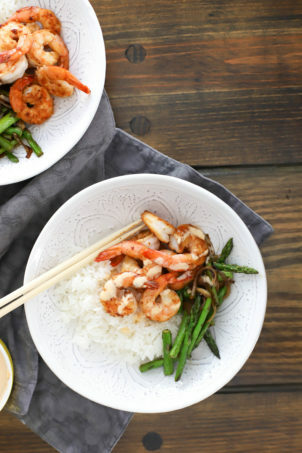 Note: This would go beautifully with Spicy Cajun Shrimp and Veggies – try it today! Looks delicious! will try this some time.